It is denoted with the symbol (!). The Factorial of any number can be, product of all the numbers that are less than or equal to that number and greater than 0. 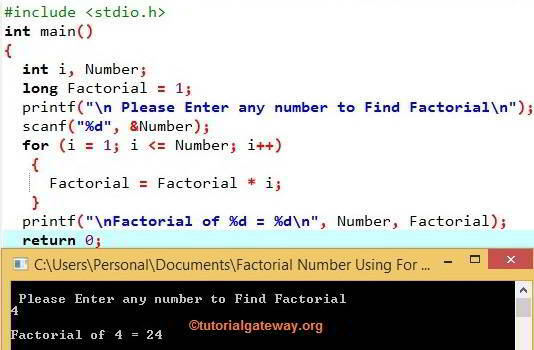 In this article, we will show you How to write a C Program to find Factorial of a Number using For Loop, While Loop, Pointers, Functions, Call by Reference and Recursion. This factorial program in C allows the user to enter any integer value. Using this value, this C program find Factorial of a number using For Loop. In this factorial program in c, we declared two integer variables i and number. We also declared one long variable Factorial and assigned a value of 1. NOTE: Although we are calculating the C factorial of an integer variable we declared output (Factorial) as a long variable. Because, When we are calculating the factorial for large integers then the result will definitely cross the integer limit. i++ means i will become 5 – It means (i <= Number) is Flase. So, For loop will be Terminated. Last printf statement will print the Factorial output of the user entered integer. Within the printf statement first %d refers to Number and the second %d refers to Factorial. This program for factorial in c allows the user to enter any integer value. Using this value, this program will find Factorial of a given number using pointers. I suggest you to refer Pointers in C article before this C factorial program example. It will help you to understand the Pointers and Pointer variable Concept. In this factorial program in c, we assigned the address of the Number variable to the address of the pointer variable. Here, P is the address of the pointer variable that we already declared (*P). As we all know &Number is the address of the Number. Within the For Loop, We checked i value against the pointer variable *P instead of Number variable. This C factorial program allows the user to enter any integer value. User entered value will be passed to the Function we created. Within this User defined function, this C program find Factorial of a number using For Loop. We already explained LOGIC in the above example. The last line ends with return Factorial Statement. It means every time we call the Calculate_Factorial () function from the main () or any sub-functions then it will return factorial value. This factorial program in c allows you to enter any integer value. User entered value will be passed to the Function we created. Within this User defined function, this C program find Factorial of a number Recursively. Please Refer Recursion in C article before this example. It will help you to understand the recursion Concept. and, if the condition is TRUE then the function will return Number * (Number -1) recursively. This C factorial program allows the user to enter any integer value. Instead of User entered value, the address of the variable will be passed to the Function we created. Within this User defined function, this C program find Factorial of a number using For Loop. Please Refer Call By Value and Call By Reference in C article before this factorial program in C example. It will help you to understand the difference between call by value and call by reference Concept.